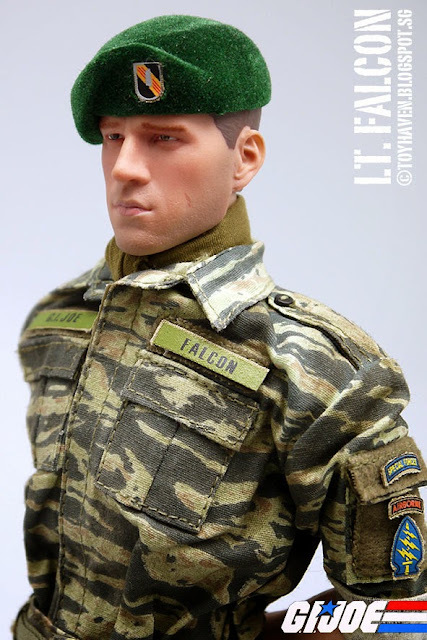 Lt. Falcon (originally just Falcon) is a fictional character from the G.I. 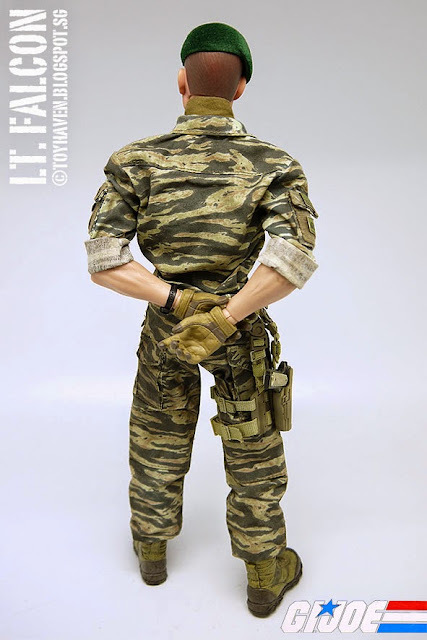 Joe: A Real American Hero toyline, comic books and cartoon series. 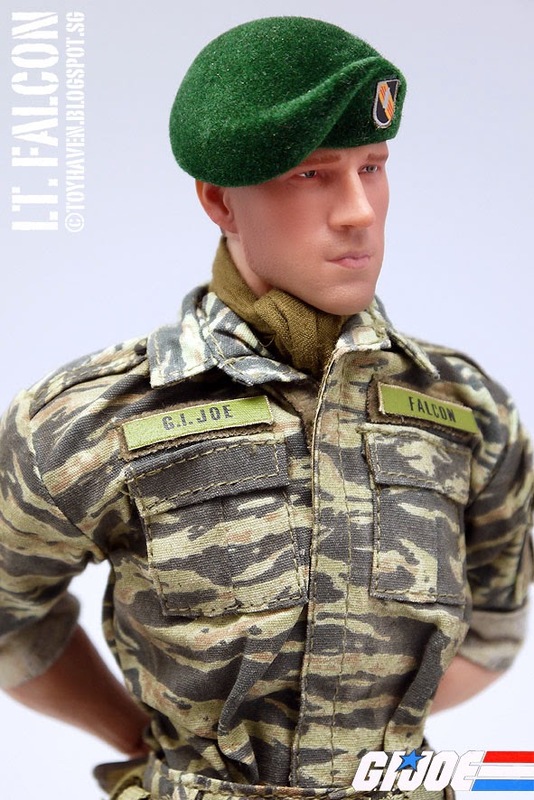 He is a green beret with the G.I. Joe Team and debuted in 1987. 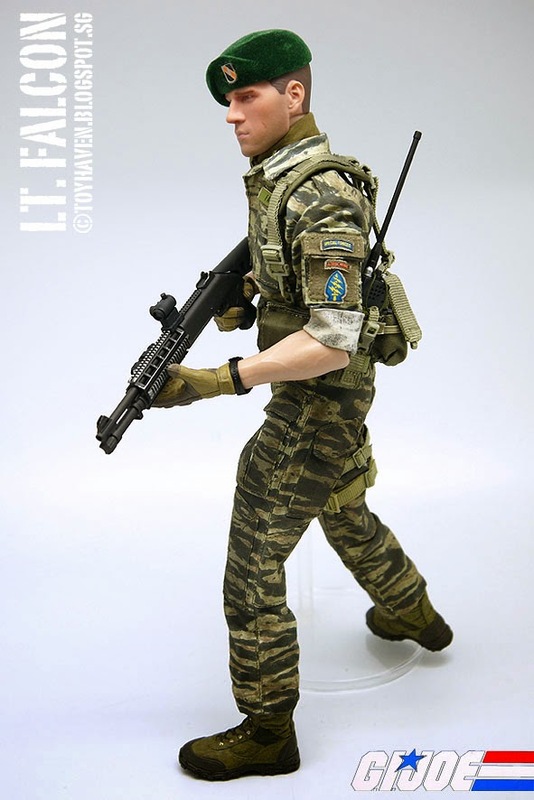 His real name is Vincent Falcone, and his rank is that of 1st Lieutenant O-2. 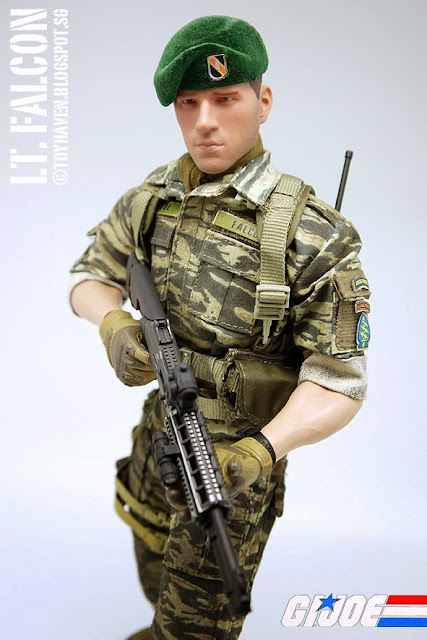 As a Green Beret, his primary function is special operations. 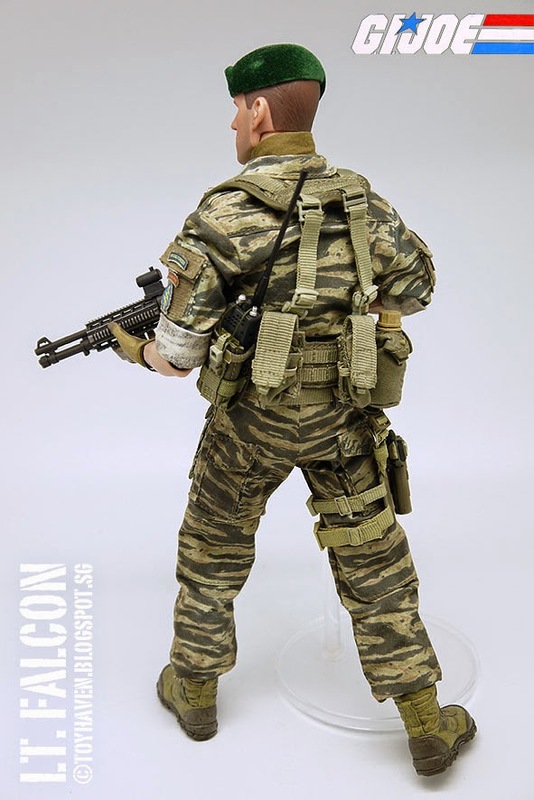 His father was also a Green Beret, who served with the 10th SFGA (Special Forces Group Airborne), making Falcon a second generation Green Beret. 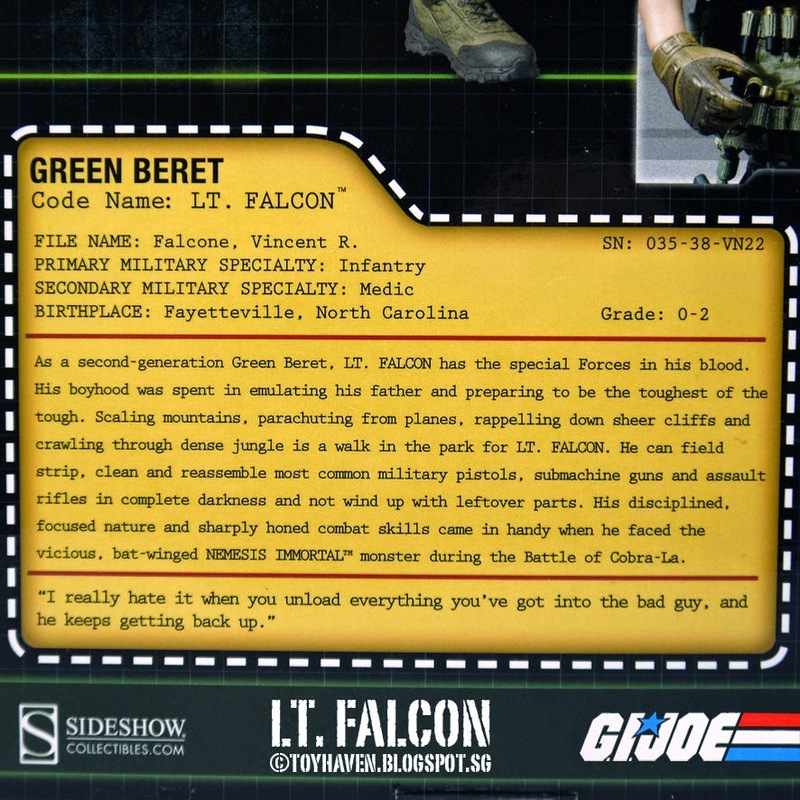 When Falcon was first released as an action figure in 1987, it had the familiar green beret headgear, and olive green fatigues with tiger stripes, and is armed with shotgun, knife, backpack and antenna. 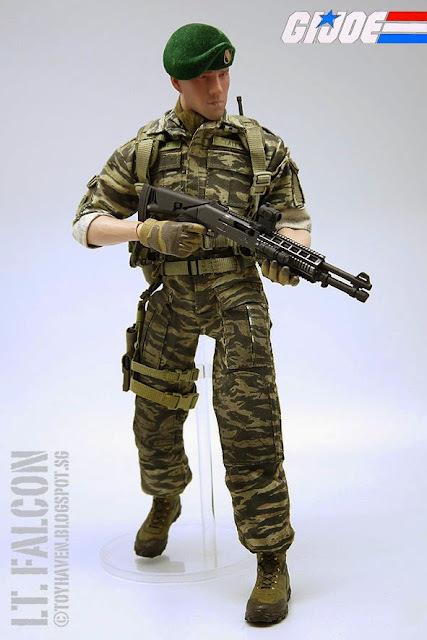 Sideshow Collectibles Comic-Con 2012 Exclusive "G.I. Joe: A Real American Hero" Green Beret Lieutenant Falcon 12-inch Action Figure is supposed to come with 1/6 scale Hand Painted Portrait, 1/6 scale Hand Painted Back Country Portrait (alternate), Fully Articulated Prometheus 1.2 Body, Generous assortment of Gloved Hands, Beret, Drive-On Rag, BDU Shirt and Pants, Sculpted Boots. Soldiers wore OD green rags on their heads during patrol. The rag was used to prevent sweat or wipe sweat from the face thus allowing the soldier to "Drive On". They were referred to as "drive on" rags until the name was shortened to do-rags (also known variously as a doo-rag, dew-rag, du-rag or durag, basically a piece of cloth used to cover the top of one's head). Among all the G.I. 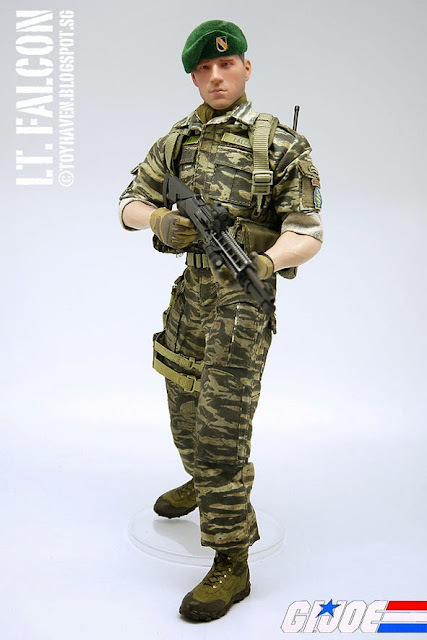 JOE: A Real American Hero 12-inch action figures released by Sideshow, this particular one caught my attention the most but I wasn't willing to shell out what they were asking for for this figure so I gave it a miss. 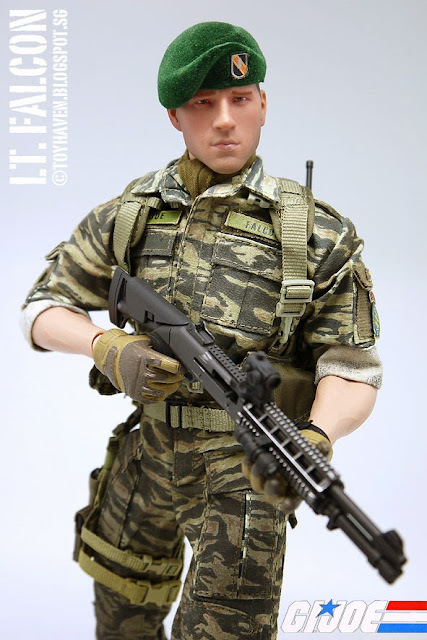 Some two years later, I saw him on sale as a loose figure (without the alternate 1/6 scale Hand Painted Back Country Portrait and backpack) and decided to get him since the asking price was fair. So I got the box and the figure with everything else minus the two items I mentioned and I'm happy with it. A short description of Green Beret Lt. Falcon for the G.I. Joe files, mentioning his primary and secondary military specialty as well as the skills learnt while training as a special forces operator. On the inside flap there are more content covering both the G.I. 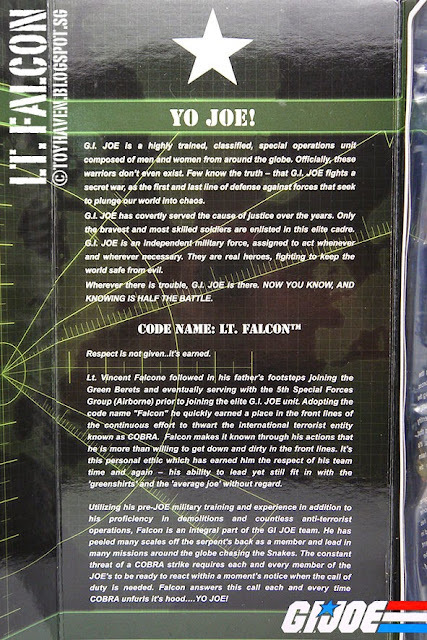 JOE team and what they stand for plus a more detailed background of Lt. Falcon. 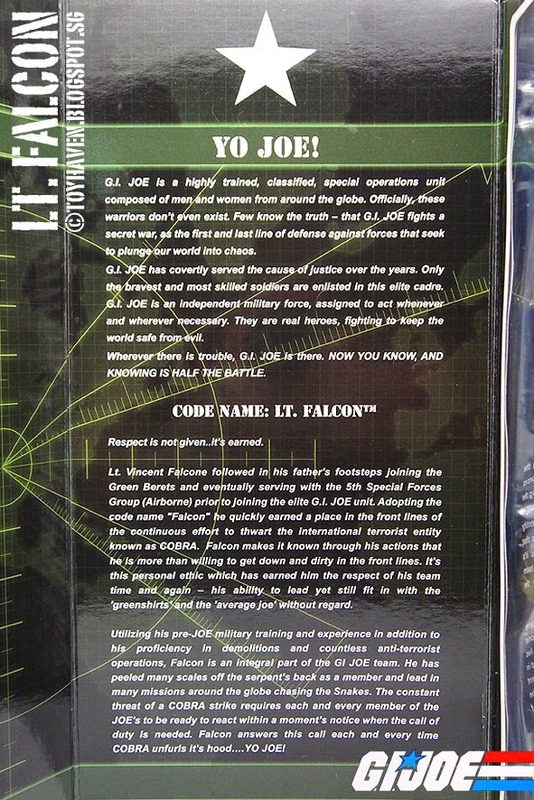 All this backstory is designed to make Lt. Falcon seem more real and believable. Weapons included with this Sideshow Collectibles G.I. Joe Green Beret Lieutenant Falcon 12-inch Action Figure: Pistol with two (2) magazines. Pistol is stored in drop-down SERPA Holster secured to his right thigh. 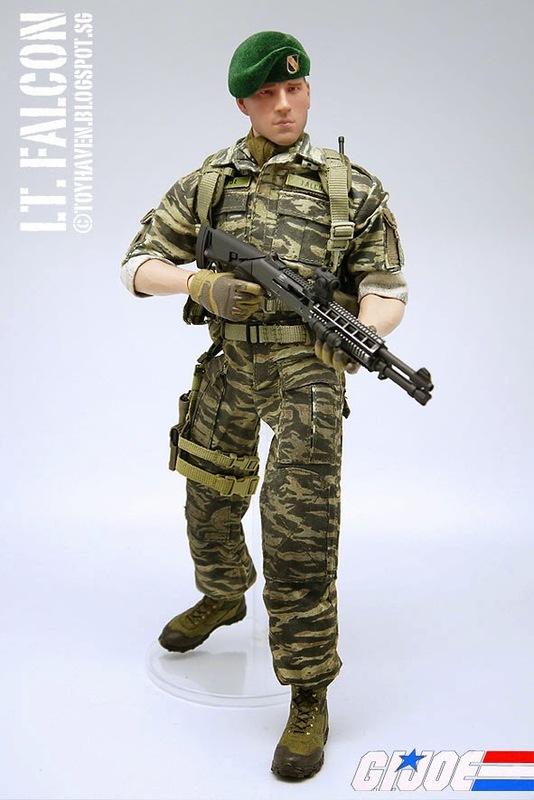 There's also the Automatic Shotgun with flashlight, red dot sight and sixteen (16) shells plus Tactical Tomahawk axe. Sideshow's Green Beret Lieutenant Falcon 12-inch Action Figure is dressed in Tigerstripe camouflage BDU (Battle Dress Uniform). 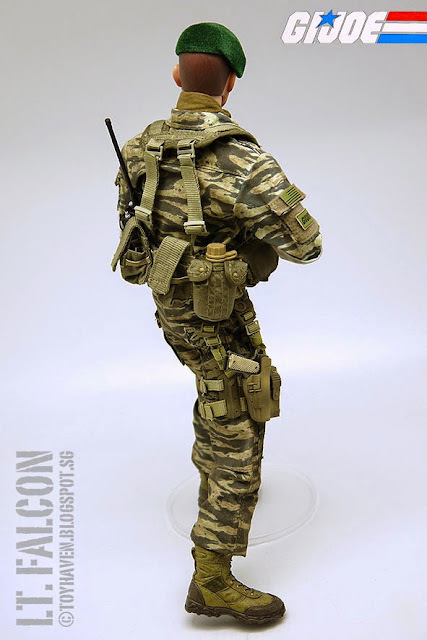 Tigerstripe is the name of a group of camouflage patterns developed for close-range use in dense jungle during jungle warfare by the South Vietnamese Armed Forces / US Forces. It derives its name from its resemblance to a tiger's stripes. It features narrow stripes that look like brush-strokes of green and brown, and broader brush-strokes of black printed over a lighter shade of olive or khaki. The brush-strokes interlock rather than overlap, as in French Lizard pattern (TAP47) from which it apparently derives. 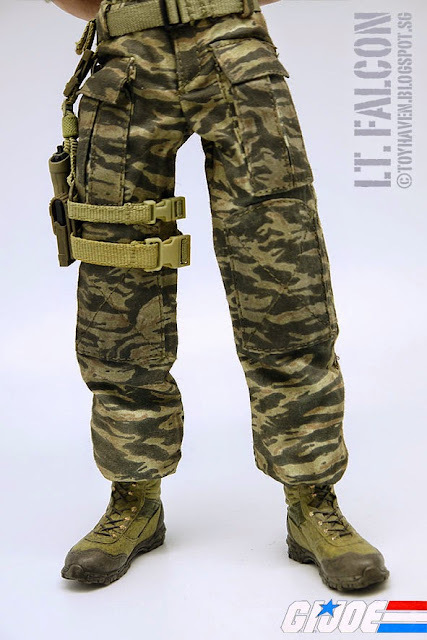 Tigerstripe was never an official US-issue item. 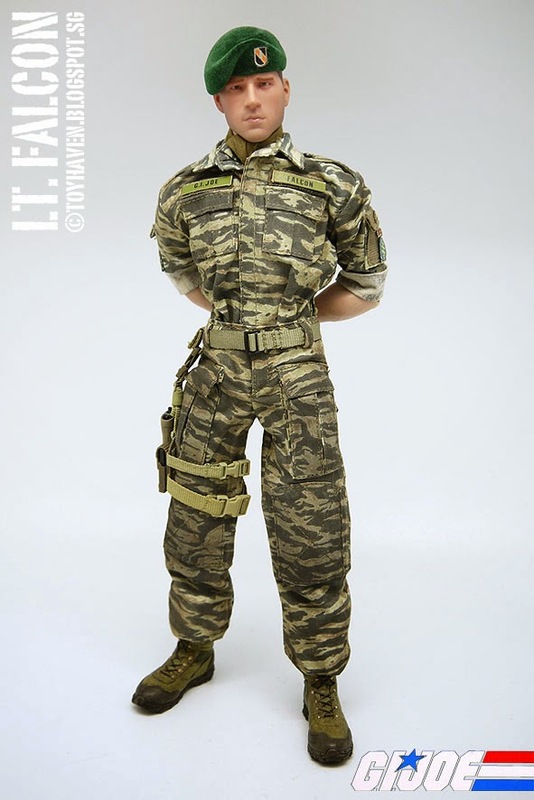 Personnel permitted to wear it at first had their camo fatigues custom-made by local tailors, ARVN uniforms being too small for most Americans; for this reason there were many variations of the basic tigerstripe pattern. From 1969 5th Special Forces Group contracted with Vietnamese producers to make fatigues and other items such as boonie hats using ARVN fabric. 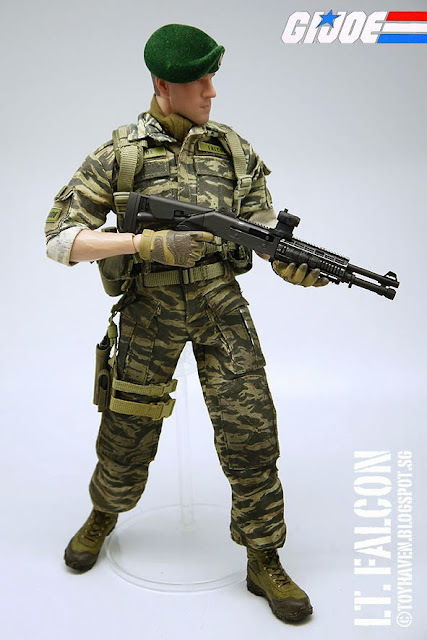 Close-up pictures of the Sideshow Collectibles Comic-Con 2012 Exclusive "G.I. 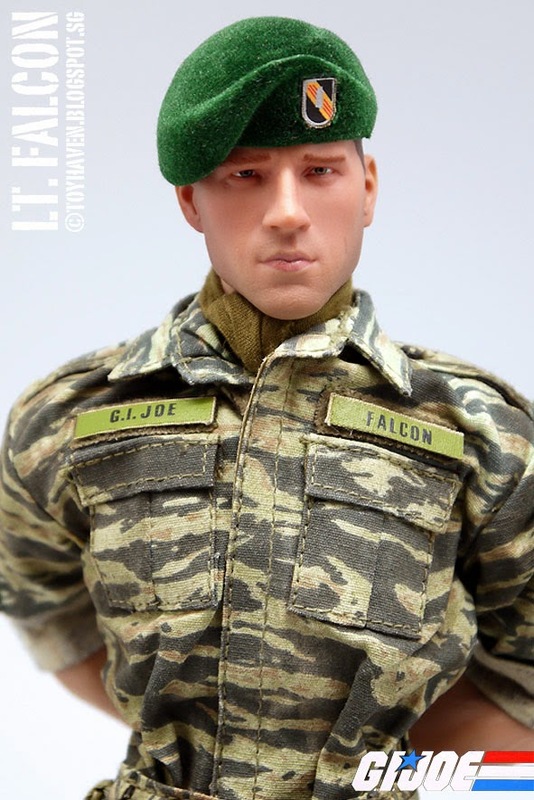 Joe: A Real American Hero" Green Beret Lieutenant Falcon 12-inch Action Figure 1/6 scale Hand Painted Portrait / head sculpt. 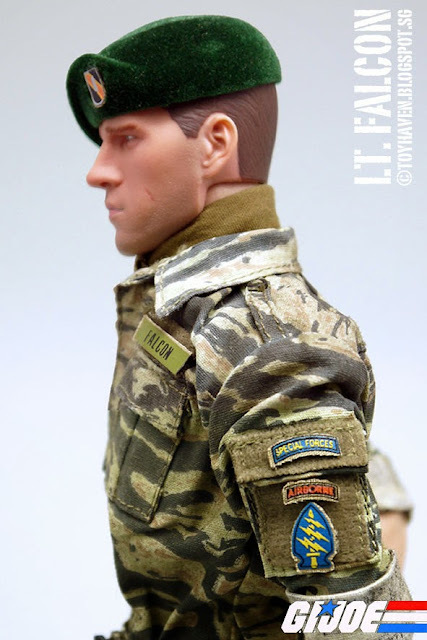 In the U.S. armed forces, the green beret may be worn only by soldiers awarded the Special Forces Tab, signifying they have been qualified as Special Forces (SF) soldiers. The Special Forces beret is officially designated "beret, man's, wool, rifle green, army shade 297." U.S. Special Forces wear the green beret because of a shared tradition which goes back to the British Commandos of World War II. On April 11, 1962 in a White House memorandum to the United States Army, President Kennedy wrote: "The green beret (the exclusive headdress of the Army Special Forces) is a symbol of excellence, a badge of courage, a mark of distinction in the fight for freedom." In addition to being the headdress of the United States Army Special Forces, "Green Berets" is also a well known nickname of the organization. 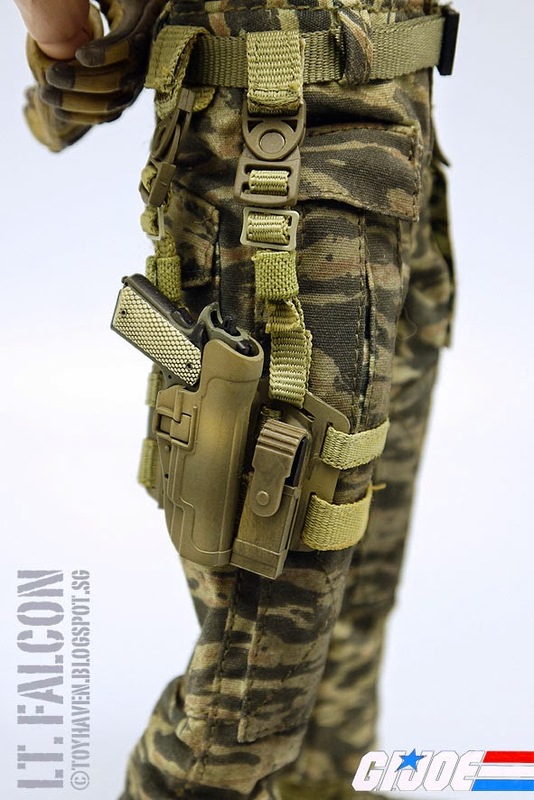 Close-up of Lt. Falcon's 1/6 scale Pistol nicely holstered in drop-down SERPA Holster secured to his right thigh with spare pistol magazine in holder as well. 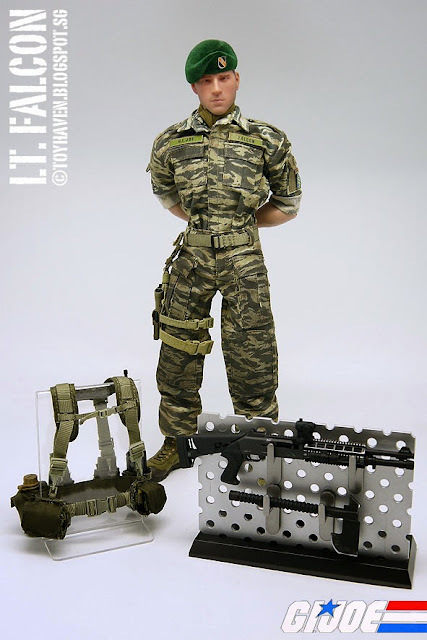 1/6 scale gear and accessories belonging to Sideshow Collectibles Comic-Con 2012 Exclusive "G.I. 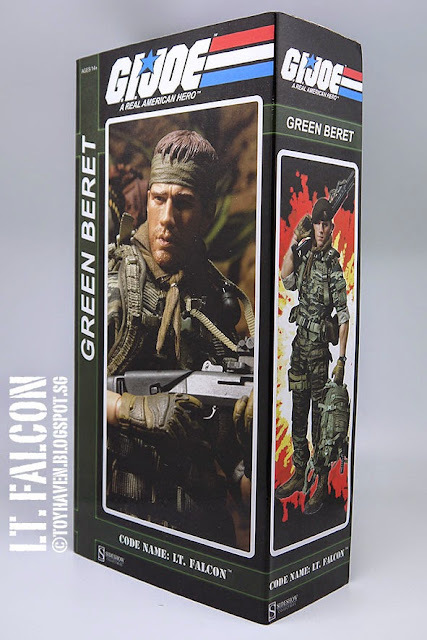 Joe: A Real American Hero" Green Beret Lieutenant Falcon 12-inch Action Figure include: MOLLE Belt, Riggers belt and H-Harness. 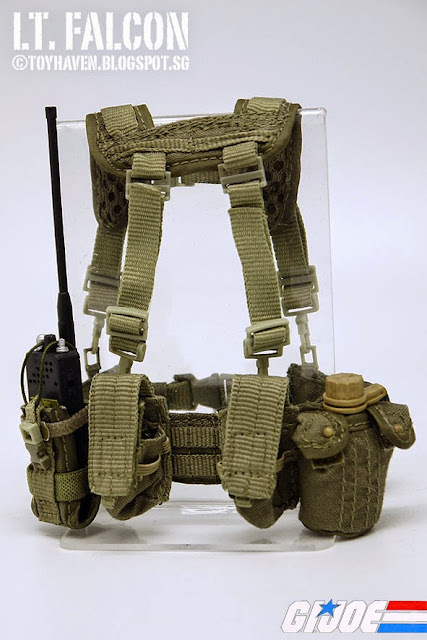 Pouches for shotgun shells, canteen and radio. Fragmentation Grenade, Wrist Watch, Radio, Water Canteen, BackPack (not shown), Velcro Patches. 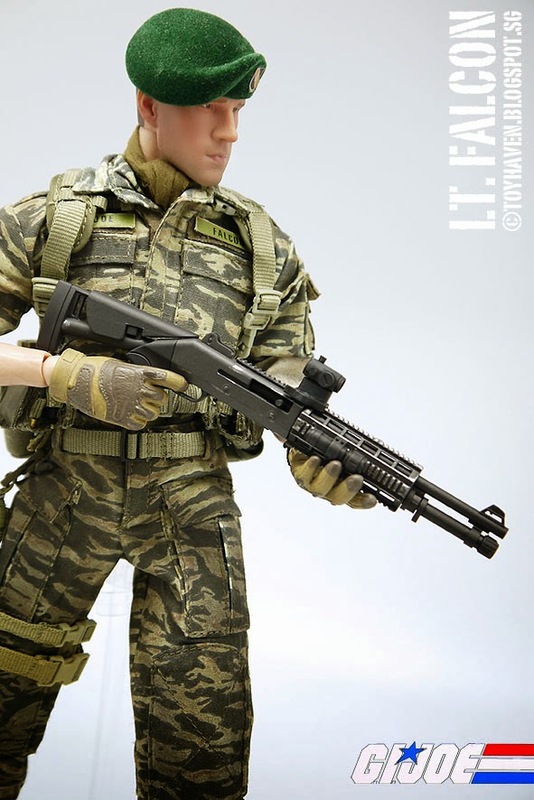 Another view of the Automatic Shotgun with flashlight, red dot sight and sixteen (16) shells plus Tactical Tomahawk axe. 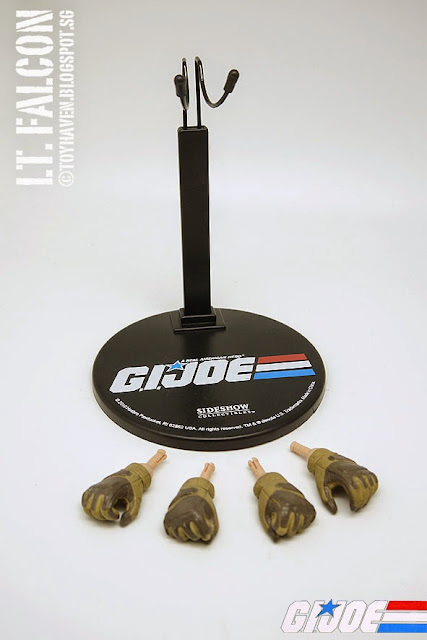 Let's not forget the 12-inch Figure Display Base with lower support stand and additional gloved hands. The hands are not as varied as Sideshow Collectibles COBRA Ninja Assassin 1/6 scale Storm Shadow 12-inch figure (see my toy blog post and first part review HERE) but they do just fine. 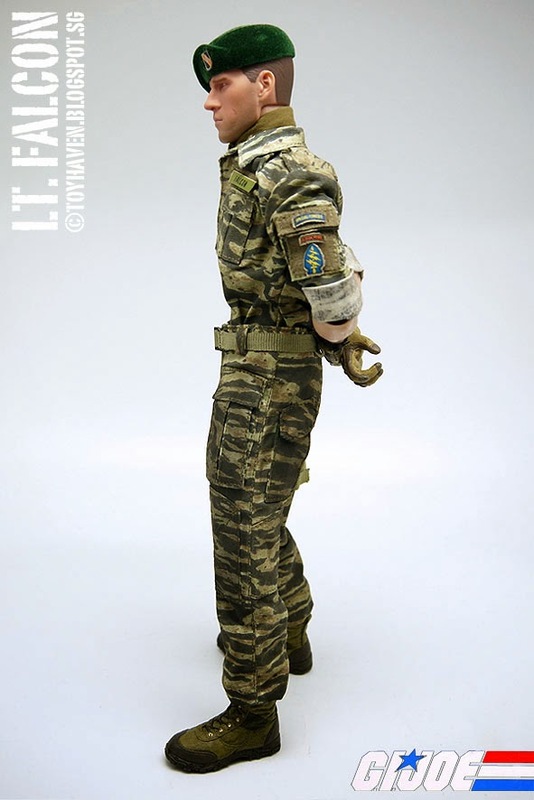 Here's Sideshow Collectibles Comic-Con 2012 Exclusive "G.I. Joe: A Real American Hero" Green Beret Lieutenant Falcon 12-inch Action Figure all geared up and armed with his Automatic Shotgun with flashlight and red dot sight. It's strange to think that the shotgun is Lt. Falcon's primary weapon of choice since it doesn't afford him the range he needs if he were to pick his enemies off at distance. Also sixteen (16) shotgun shells won't be enough to last him in a firefight if he gets himself embroiled in one. 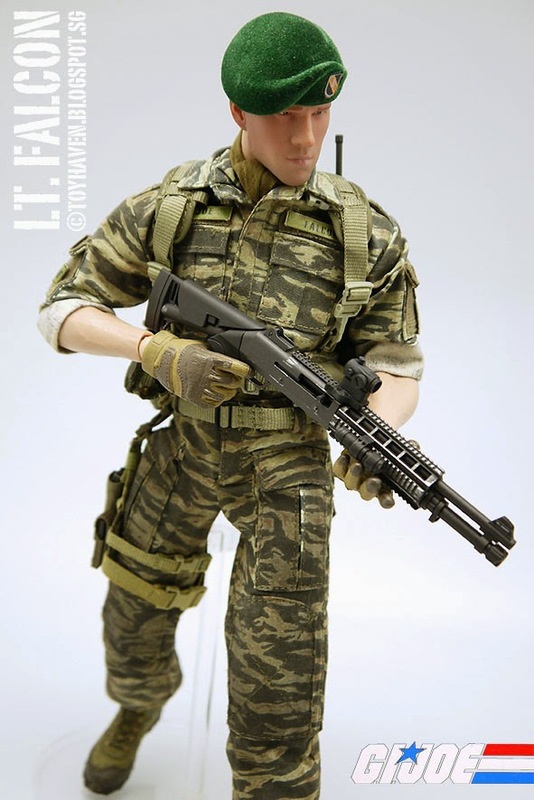 The shotgun that Lt Falcon has appears to be the Benelli M4 Tactical shotgun, a unique, Auto-Regulating Gas-Operated (A.R.G.O.) semi-auto. The M4 Tactical is the combat service shotgun of the U.S. Joint Services today because of its Battle-proven reliability. The sights are military-style ghost ring and are adjustable in the field using only a cartridge rim. 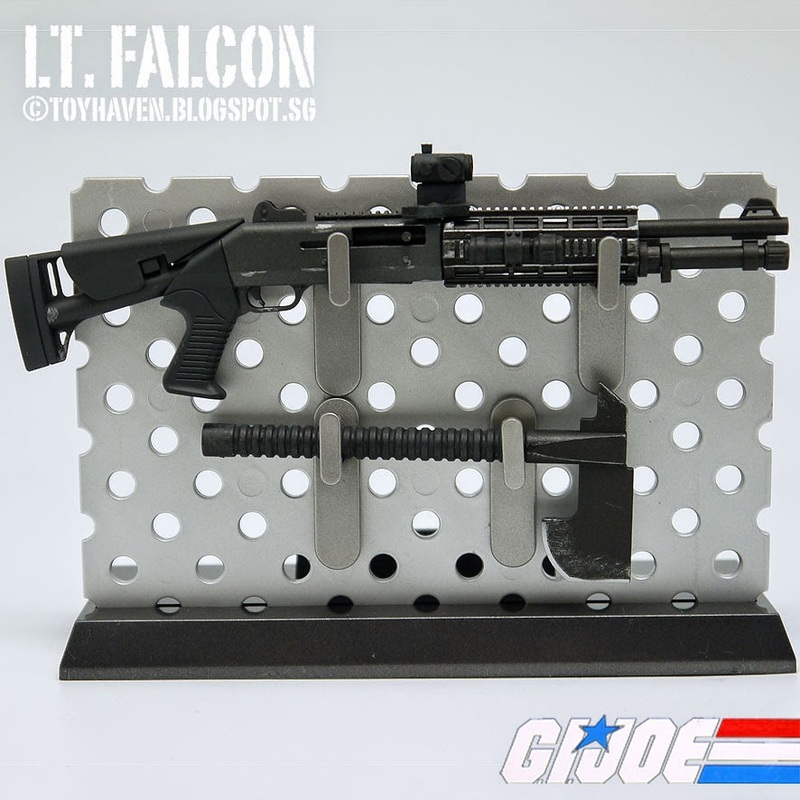 The MIL-STD-1913 Picatinny sight rail on top allows use of both conventional and night-vision sights, while retaining use of the original sights. 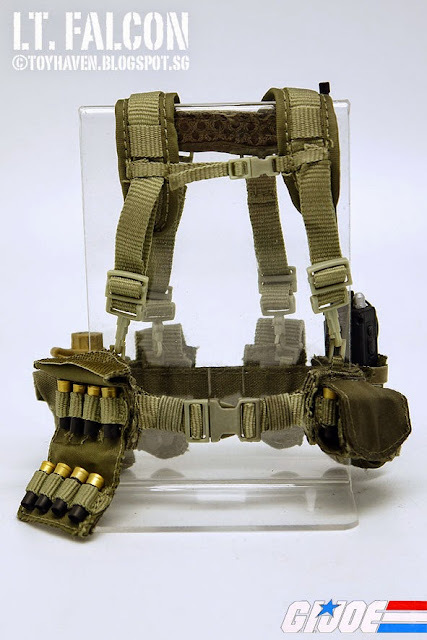 The rail interface system or Picatinny rail, built into the top of the shotgun accepts scopes, laser illuminators, night-vision sights, and flashlights. In the jungle warfare during the Malayan Emergency, the British Army and local forces of Malaysia used shotguns to great effect due to limited space in the jungles and frequent close combat. In the Vietnam War, the shotgun was used as an individual weapon in the American army during jungle patrol and urban warfare like the Tet Offensive. In operations in post-invasion Iraq, US forces used their combat shotguns to clear out suspected insurgent hideouts in house to house fighting. In modern times, with Mechanized Infantry tactics armed forces don't need to "march to battle" as in earlier conflicts. Because of this, they are able to omit the difficult choice of selecting only one weapon in order to save weight. 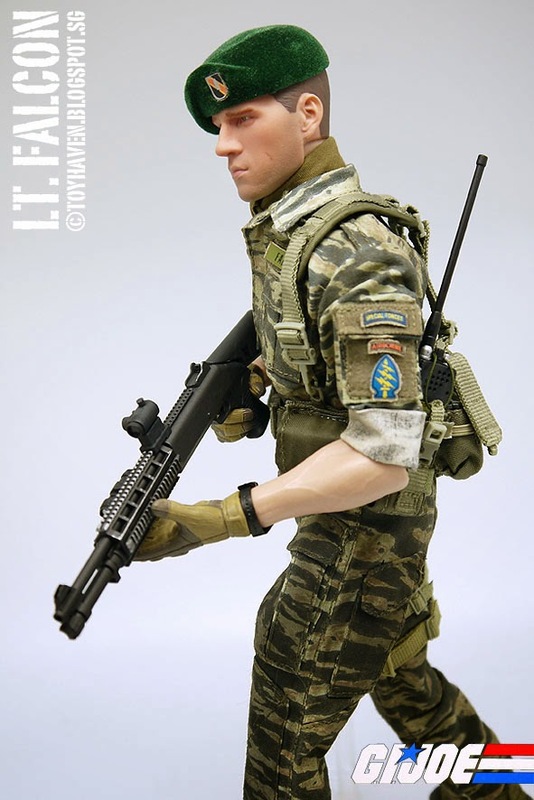 This allows the individual soldier to carry a shotgun as well as an assault rifle during battle. 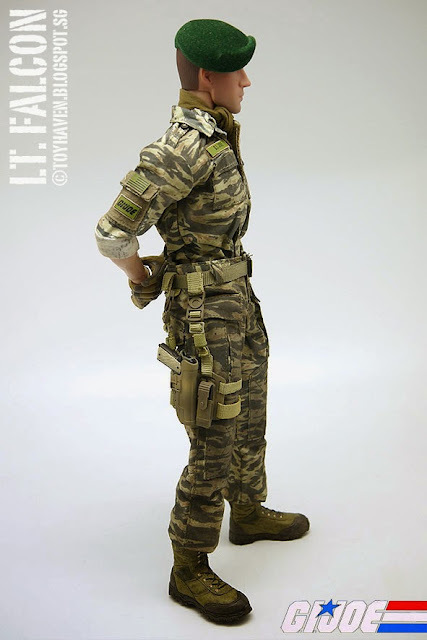 NEXT: Sideshow Collectibles G.I. 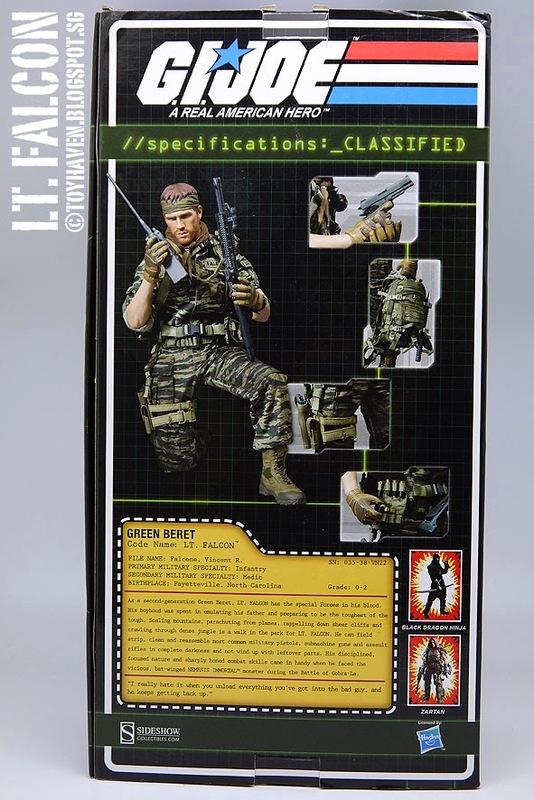 Joe Green Beret Lieutenant Falcon 12-inch Action Figure draws his sidearm and engages the enemy.